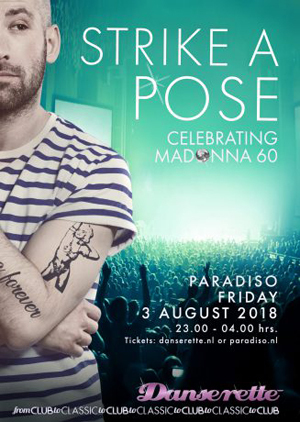 Here is your chance to buy a ticket to the Madonna dance event not to be missed in legendary venue Paradiso Amsterdam on August 3. 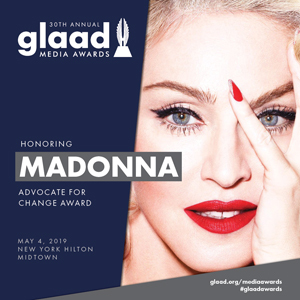 When you buy your ticket to Strike a Pose Celebrating Madonna 60, MadonnaUnderground visitors get an exclusive discount code. There is only a limited supply so act fast! Buy your ticket HERE, use code Underground3818 (vouchercode) for a 2.50 EUR discount! She is one of the most influential and successful pop artists ever and in August she turns 60: Madonna. Therefore a big smashing danceparty at Paradiso, playing all her hits from almost 4 decades: from Holiday to Give me all your luvin’. And don’t you think there’s a better time to do that than at The Amsterdam Pride weekend?. Afterall, the Queen of Pop is a gay icon. Five hours of just Madonna might be a bit too much though. That’s why we also spin many hits from other queens: from Whitney to Beyoncé. Strike a Pose! 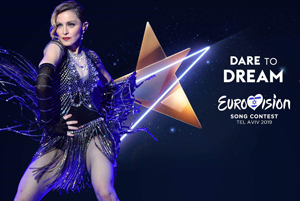 Together with you, Danserette is lookingfor the most ultimate Madonna dance hit from her almost 40-year career. Will it be Holiday, Express Yourself, Jump or maybe Vogue. 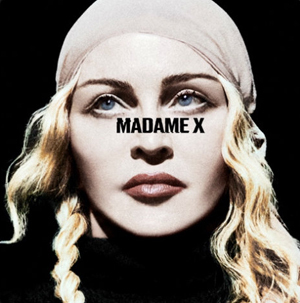 Choose it now from the list of 20 Madonna dance hits we prepared for you.